Christopher Columbus was the Italian explorer who promoted the colonisation of the New World during four courageous voyages in the 15th century. Sails of Gold is an online slot from Play N Go which is themed on this great adventurer and you can read all about it below. 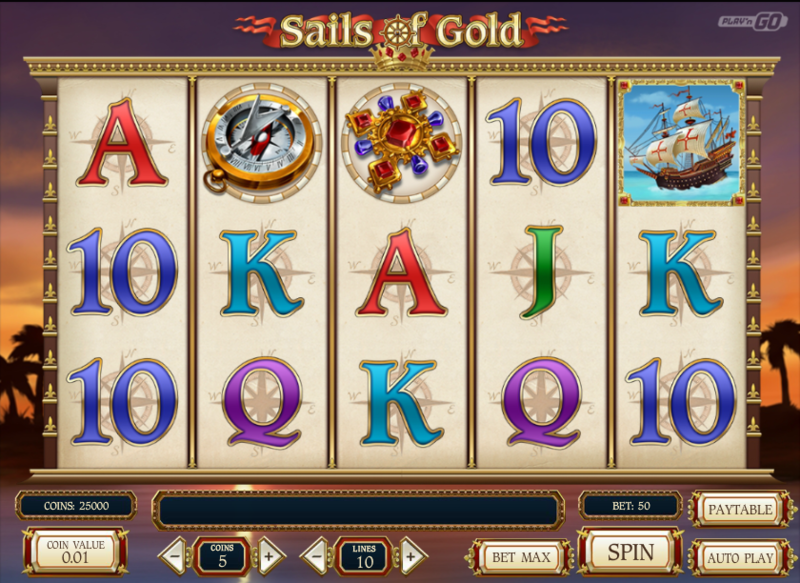 Sails of Gold is a five reel slot with three rows and up to ten paylines; it’s a very regal design which encompasses those reels and in the background we can see the sun setting over palm trees and a calm sea. There are three theme-related symbols including a naval badge, a brooch and a compass; lower values are the standard 10, J, Q, K and A. The telescope-wielding Colombus is the wild symbol and he will substitute for all others except the scatter – that’s his white-sailed ship and it’s the key to the man feature. This round is triggered by landing three of the ship scatter symbols anywhere on reels one, three and five; you can retrigger more spins by repeating this combo during this round. Additionally an extra golden wild ship is added to the reels during the spins to help out with some more winning combos. When the round is over you will be returned to the base game. Any win can be gambled by clicking the ‘Gamble’ button below the reels after a win; you now have the opportunity to double or quadruple that win by guessing whether the next card drawn is the correct colour or suit. 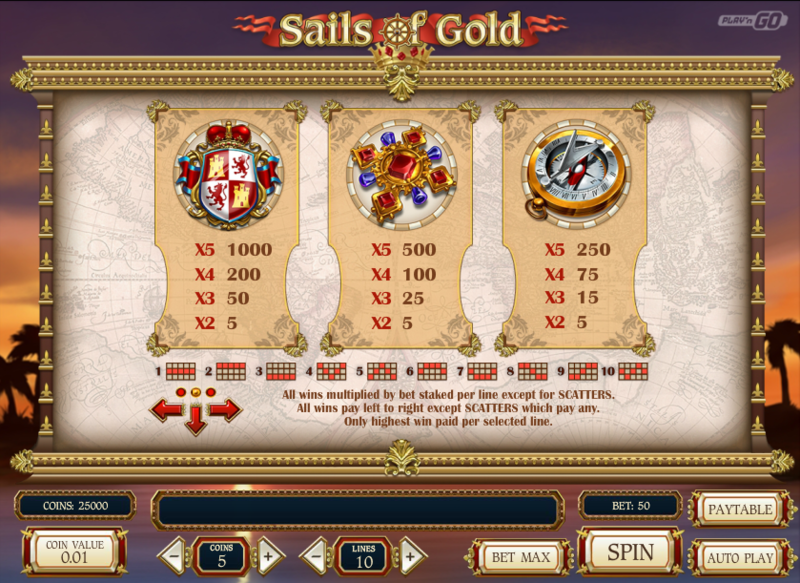 Sails of Gold is decent enough diversion which is similar in design to Play N Go’s recent Book of Dead slot; that’s Ok though, we like the theme and the free spins and it comes with an RTP of 96.25%.